So on Monday, I posted Hazel and her afternoon dress from 1940. That was kind a formal 1940’s look, so I wanted to show of something maybe a little less fancy for today. 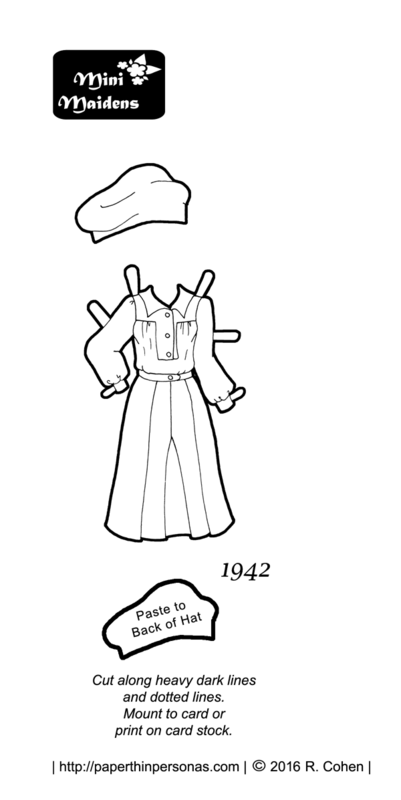 This Dubarry pattern from 1942 is a great example of the masculine influenced dresses of the early 1940s and I recreated as a 1940’s paper doll dress to print and color. To go with it, I drew a beret which was a very popular hat style, but I’ll admit- beret drawing is maybe not my great strength. So, a few things about this dress. It’s based on a pattern by the DuBarry company. DuBarry was a branch of Simplicity Patterns that were made from 1931–1946 exclusively for Woolworths. The wonderful Vintage Pattern Wiki has a bunch more Dubarry styles available for browsing, if you want to pop over there to see them. Two of my other 1940s favorites from Dubarry are this wedding dress from 1941 and this dress from 1944. Most of the dresses I have drawn for this week come from sewing pattern covers. Though not always an obvious source for fashion history, sewing patterns, like catalogs, are useful to see what normal folks had access too. Most people weren’t buying designer clothing after all and I like to keep my paper dolls a little down to earth… except when they’re aliens. The downside of these sorts of primary sources is that it is impossible to know what people thought about the pattern design. Did they like it? Was it popular? Did people think it as ugly? For example, here’s a Simplicty pattern for a strange lace up poncho. Will some historian in the future think we all wore lace up ponchos in 2016? Probably not… but it highlights some of the danger of not using multiple sources when making decisions about what to create for historical paper dolls. By the way, what do you think of today’s 1940’s paper doll dress? Do you like it? Hate it? New content announcements, plus other interesting stuff, goes up pretty regularly on the blogs Twitter feed. Also, if you love the blog, then support it on Patreon. I really like this series! Love the dresses. 🙂 Thank you. You’re welcome. I think it’ll be a fun week. I like the dress. The 40s aren’t covered much in the media I watch, so it’s nice to get a different perspective. If you want a good show set in the 1940s, there’s one called Foyle’s War which is just a wonderful mystery series.